Built in 1911, the Beckham County Courthouse is one of the few courthouses in Oklahoma topped by a large dome. 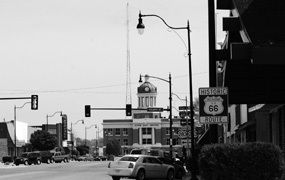 One of the tallest buildings in Sayre, the courthouse has been the center of civic and legal activity for nearly a century, and remains a landmark in this community of approximately 4,000 people. The three-story, brick-and-stone courthouse with massive Tuscan columns replaced an earlier two-story brick building just four years after Oklahoma became a State and Beckham County was formed. Officials chose a location just half a block from the train tracks for the court square. The railroad was the most crucial link between the town and outside commerce, and the substantial Neoclassical courthouse sought, through design and placement, to provide railroad travelers from within the county or further away with an impressive first encounter with Beckham County and its government. Beckham County was, at the time of its founding, largely agricultural, producing cotton, wheat, alfalfa, kafir, milo maize, and broomcorn. Agricultural processing became important to the town. By 1909, Sayre boasted two cotton gins, and by 1918 two more, and two grain elevators and a flour mill operated in town as well. In the 1920s, companies drilled oil and gas wells around Sayre, and within a decade, five oil companies and a gasoline plant operated there. The courthouse stood on Sayre’s main square for less than 20 years before the routing of Route 66 through the town in 1928. That was when Sayre changed. Within a couple of years, the town tied its fate to feeding and fueling the steady stream of people exploring the country in automobiles on the east-west Mother Road. In the 1930s and 1940s, the town built and maintained a public library, a hospital, a forty-acre city park, a golf course and swimming pool, baseball and softball fields, a racetrack, and rodeo grounds. Sayre Junior College opened in 1938 and merged with Southwestern Oklahoma State University in 1987. By 1937, Route 66 was paved through the entirety of Oklahoma. During the 1930s and 1940s, Sayre felt and looked like the beginning of the real West to travelers from Chicago to Los Angeles. The town’s website still boasts of being the place where the spirit of the West is still alive. Working ranches are common in this part of Oklahoma. You might hear somebody’s spurs rattle on the courthouse square and not think much about it. In the midst of that change, the old courthouse that the architectural firm of Layton, Smith, and Hawk designed provided a formal and fitting centerpiece. The north and south sides of the building have wide pilasters, and the third floor is distinguished by a cornice of copper sheeting. Dentils and pearl molding line a brick parapet. Twelve Doric columns support the large clock dome, which in turn is topped by 12 Doric columns supporting a smaller dome. This beautiful and distinctive design won the courthouse a 30-second appearance in the final cut of John Ford’s movie, The Grapes of Wrath. The courthouse was listed in the National Register of Historic Places in 1984. The building is not Sayre’s only feature associated with historic Route 66. The highway meanders through the town’s historic district, centered on Main and Fourth Streets, which is listed in the National Register. Many of the area’s buildings are being refurbished to reflect their original appearance. The old Owl Drug Store served milkshakes to Route 66 travelers for many years, and the old Stovall Theater entertained them with movies on its wide screen. Even more unusual is the pedestrian underpass at the center of Fourth and Elm Streets, a walkway that provided safety from congested Route 66 traffic. In 1975, Interstate 40 replaced Route 66 through Beckham County, diverting through traffic away from the downtown core. 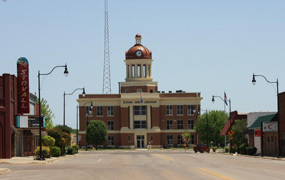 The Beckham County Courthouse, at 302 East Main St. in Sayre, OK, still houses government functions, and is open Monday-Friday, 8:00am to 4:00pm. The courthouse is accessible to wheelchairs. Call 580-928-3330 for information or visit the court's website.